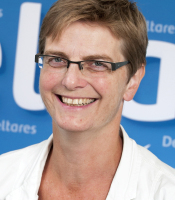 Annemargreet de Leeuw leads the department of Water Risk Analysis at Deltares. Her role is to guide this team of excellent experts, to set out the strategy for the department and to perform daily management of the portfolio. The experts in the department have a variety of excellent knowledge on, amongst others: a) statistical regional analysis of weather, b) probabilistic analysis of hazards (sea level, river discharge, rainfall, groundwater, etc.) c) impact analysis, d)robustness and resilience analysis, e) climate change. Risk analysis involves the quantification of the probability of potential damaging events, the associated consequences and the ability of the system or society to recover from such events. Water management can benefit from a risk-based approach, in which management alternatives are compared based on the resulting reduction of risk. Relevant water related risks include floods, droughts, contamination, salt water intrusion, and land subsidence. Different sets of mitigating measures can be evaluated for different scenarios of climate change and development of the area under consideration. The effectiveness of measures is expressed in terms of risk reduction. The advantages of applying a risk based approach are that it brings a uniform knowledge basis with which different types of measures can be compared, using the same criterion (risk reduction), and that reduced economic risk can be considered the economic benefit of measures. A cost-benefit ratio can easily be derived. In these projects the department of Water Risk Analysis builds a comprehensive computational framework for the flood risk analysis of the two catchments. A probabilistic analysis of the precipitation is carried out; the derived rainfall patterns are used as meteorological forcing for the distributed hydrological model. This model is calibrated to represent peak flows of the tributaries of the main river which was modeled in Sobek 1D. Vulnerable regions and cities along the rivers are studied in detail, using a Sobek 2D model. The economic damage assessment is carried out in a subsequent step, using the Flood Impact Assessment Tool (FIAT) recently developed by Deltares. With this comprehensive and flexible framework we set the standard for other catchments in Turkey, and support the Turkish government with adequate information as a strong knowledge base for their flood risk management plans. In 2011 major floods in the Brisbane River basin led to two billion (Australian) dollars economic damages and 38 fatalities. The government of Queensland, Australia, recognized the need for an improved flood management plan, and issued a call for a basin-wide flood study to support it. Deltares is the main contributor in a consortium to carry out a comprehensive hydrological study to determine the probabilities that extreme flood levels throughout the basin are exceeded – which is the most relevant information for computing the flood risk in the catchment. The Brisbane river basin is a complex and heterogeneous system. Current methods in Australia to estimate probabilities of flood events use simplified representations of the physics of the basin and ignore the heterogeneity of rainfall patterns. Deltares addressed these issues by implementing an efficient Monte-Carlo-based probabilistic framework. Synthetic rainfall events are generated with a state-of-the art radar-based downscaling model, resulting in realistic spatial-temporal rainfall scenarios, which are then fed into hydrological and reservoir models. The results of the analysis are the exceedance probabilities of water levels, river discharges, and flow volumes at key locations in the catchment. The results of the analysis are stored in the data-handling platform Delft-FEWS, which will make it user-friendly for water managers to consider flood scenarios with specified probabilities when considering management options. The new flood frequency method developed by Deltares, which have been published in peer-reviewed conference proceedings, as well as presented in multiple conferences and stakeholder meetings in Australia, are expected to set the standard for flood frequency analysis in Australia. Follow-up phases of the project will use the developed tools to develop a basin-wide flood and drought risk management plan – life saving, and cost effective. The Water Risk Analysis department develops a methodology to determine the cost of flood impacts and the effect of climate change at a European scale. We give recommendations on how to deal with associated uncertainties and scaling effects in this European-wide damage assessment. The results for different climate change scenarios from top-down approaches using global models are compared with outcomes from bottom-up methodologies, i.e. local and micro-scale flood risk studies. For this, local case studies are carried out, among others, in the Ebro basin (Zaragoza, Spain). The method is built in a flexible computational framework for flood damage assessments on different scales (Flood Impact Assessment Tool – FIAT), in which scaling effects and related uncertainties are of highest relevance. This will allow us to apply the knowledge in other large scale applications and in data scarce regions. This project started at the end of 2014, and aims at the development of economically efficient and sustainable water management strategies in Florida, USA. The department of Water Risk Analysis designs and builds a decision support system to assess the costs of weather extremes, in particular damages due to floods and droughts, and their mitigation, in order to support decision makers by weighing the costs for adaptation and the benefits of damage reduction. Long-term planning horizons require that estimations of potential climate change impacts are included in the assessment. We base our approach on earlier work for developing robust flood and drought risk management strategies and on the award-winning method for cost-benefit analysis for the Delta Program in The Netherlands (Franz Edelman Award 2013). The methods are applied to flood and drought risks in the Florida Everglades and adjoining urbanized areas such as Miami, Fort Lauderdale and Palm Beaches. The proposed method will substantially support better decisions for managing water resources in this area, and thereby potentially reducing damage and investment costs. If there were no flood defences, 55% of the Netherlands would regularly be under water. Flood defences provide the necessary safety to the hinterland. The currently used standards date back to the 1960s. However, climate change and demographic and economic development urge the Netherlands to update their standards. To this end, flood risk was assessed nationwide. The department of Water Risk Analyses supports the assessment of flood risk by calculating economic risk, individual risk and societal risk. This information is used as input in the application of the award-winning method for cost benefit analysis for the Delta program (Franz Edelman Award 2013) to derive economically efficient safety standards, and in six regional discussions on new standards for the flood defences. The new standards will be enforced by law from 2015. The developed risk assessment knowledge and tools, now applied in the regions in the Netherlands, are world-wide applicable. The 3,800 kilometres of primary flood defences in the Netherlands must all meet stringent safety standards, and – by law – the water boards must regularly assess the defences to ensure they meet those standards. It is imperative that these assessments be reliable, and that quality software and clear guidance documents are provided for the water boards to uniformly and consistently assess all of the Dutch primary flood defences (levees, dunes, and hydraulic structures) against the new, risk based standards. The department of Water Risk Analysis leads the cluster of applied research on probabilistic modelling and dealing with uncertainties. Uncertainties are inevitable: a) it is impossible to measure the actual strength, b) the assessment concerns extreme events that have not yet occurred and c) our physical and numerical models only give an approximation of the reality. A balance needs to be found between taking assessed uncertainties into account and appropriate conclusions about the safety of the assessed flood defence – hence the conclusion on the necessity of infrastructural works. The research project leads to simple, applicable guidelines and software to assess the flood defences, taking uncertainty into account, yet still in a cost effective way. The research focussed on system robustness as a new decision criterion to assess flood and drought risk reduction strategies. System robustness describes how well a system can deal with extreme events such as floods and droughts. It is an addition to the traditional criterion of risk, because it quantifies under which conditions impacts are too large to recover from. The concept of system robustness was made operational by proposing three quantifiable criteria: 1. the resistance threshold, being the point where socio-economic impacts first occur; 2. the proportionality, which refers to the graduality of the response increases with increasing event magnitudes; 3. the manageability, which is the ability to keep the response below a level from which recovery is difficult or impossible. These criteria were tested in two flood cases and two drought cases. The cases have demonstrated the applicability of the framework and have provided insight into the characteristics that influence system robustness. Furthermore, the case studies demonstrated that assessing system robustness may change the preferred order of management strategies. It was concluded that a robustness perspective supports decision makers in exploring low-probability/high-impact events and considering whether these impacts are societally acceptable. Quantifying robustness inspires the development of strategies that reduce flood and drought risk in a way that disasters are avoided as much as possible. The department of Water Risk Analysis built and applied a probabilistic modelling framework for the assessment of multiple strategies to increase long-term flood resilience of a highly urbanised system. The probabilistic nature of the framework enables the quantification of annual expected damages for combinations of strategies, different measures, and future scenarios like climate change, land subsidence and urbanisation. The framework was applied for Ho Chi Minh City, Viet Nam, which ranks among the Top 10 cities in the world in terms of exposed population affected by climate change. From this project, a preferred strategy was identified to increase the city’s flood resilience. The case study shows that the framework is capable of quantifying the impact of strategies to increase flood resilience, with a specific added value for delta areas, where multiple flood forcing factors interact. Annemargreet was the Coordinator of the extremely successful second European conference on flood risk management in Rotterdam. Deltares and HR Wallingford organized FLOODrisk2012 supported by Floodcontrol2015, Knowledge for Climate and European projects. Almost 550 scientists, practitioners and policy makers visited the technical sessions, special sessions, poster sessions and the serious game room. By organizing international conferences like the Floodrisk series, we build a long-lasting podium for knowledge exchange and cooperation in flood risk expertise. In response to the continuous development and urbanisation of the rural New Territories, the Drainage Services Department of Hong Kong commissioned in April 2008 a study to update an existing Master Plan for the Yuen Long and North Districts. The area is subject to high intensity rainfall, generating flash floods which are drained to the surrounding seas within a few hours. Hydrological and hydraulic processes are very complex, especially when high intensity rainfall occurs, such as the 145 mm measured during one hour on June 6, 2008. For this study Mott MacDonald Ltd, Hong Kong contracted Deltares to provide support on field surveys, collection and statistical analysis of data (a regional frequency analysis was performed), mathematical modeling of the drainage system behavior, estimating climate change impacts, green channel design, sedimentation in drainage channels and receiving estuaries, impacts and management of mangroves, designing sustainable urban drainage systems, recommending improvements of the Hong Kong storm drainage manual and analyzing flood management options. The Water Risk Analysis department performed a regional frequency analysis to derive an adequate rainfall-run-off model, and a probabilistic analysis to combine rain storms and sea levels. The work resulted in critical flood levels throughout the drainage system. Klijn, F., Knoop, J. M., Ligtvoet, W., & Mens, M. J. P. (2012). Nat. Hazards Earth Syst. Sci., 12(5), 1469-1479. Present Co-chair of the Advisory Board of Floodrisk2016 Deltares, Samui and HRWallingford are initiators of the Floodrisk conference series. Annemargreet is co-chair of the Advisory Board of Floodrisk2016 in Lyon.